 MATTRESS RESOURCE ORDERS DISCOUNTED, BULK MATTRESSES DIRECTLY FROM THE NAME-BRAND MANUFACTURER. THEN, WE PASS ALONG THESE INCREDIBLE SAVINGS TO YOU ALLOWING YOU TO RETAIL WITH DISCOUNTS UP TO 80%! Promotional model mattresses with an interwoven coil and promotional all foam models. Mattresses with an interwoven coil. Models may include Euro Top and foam encased mattresses. Mattresses with either interwoven coil or individually wrapped coil. Mattresses are foam encased. Pillow Top mattresses are available. Mattresses feature individually wrapped coils and foam encasement. Other features may include: Memory Foam, Gel, Cooling Agents, Specialty Bedding and Latex. Mattresses with individually wrapped coils and foam encasement. Mattress features may include: Memory Foam, Gel, Cooling Agents, Latex, and Hybrid Models. Mattresses with premium retail value. Inventory may be from specialty manufacturers, and handmade inventory. Click here to contact us right now and we will respond to your request within 24 hours.